The U.S. Federal Reserve Building in Washington, Jan. 26, 2010. The third try was the charm to create a central bank in the U.S. The First Bank of the United States lived for 20 years starting in 1791, killed by opposition from southern representatives who thought it only benefited business interests in the North. The Second Bank of the United States died in 1836 amid opposition from President Andrew Jackson who argued it made "the rich richer and the potent more powerful." 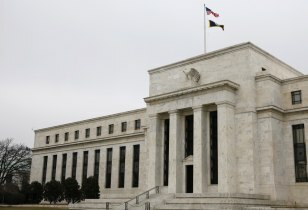 If that sounds familiar, it’s because those accusations are still lobbed at the third incarnation: The Federal Reserve, chartered in 1913, which currently faces a public outcry over its response to the financial meltdown of 2008. Federal Reserve Chairman Ben Bernanke has guided the nation through the worst of it. But he went through a tough reconfirmation process because of legislators who played the populist card and criticized the Fed of favoring Wall Street over Main Street. All of that may be due to a misunderstanding of the Fed’s role. According to the Federal Reserve Act, the institution's main job is to "maintain long run growth of the monetary and credit aggregates ... so as to promote effectively the goals of maximum employment, stable prices, and moderate long-term interest rates." The powers the Fed has had at its disposal to do this have changed drastically since its founding. Bernanke follows in the footsteps of 13 previous leaders. Some lasted no more than a few years and seem nearly lost to history. Some changed history — transforming the institution from its humble beginnings to become the most powerful central bank in the world. 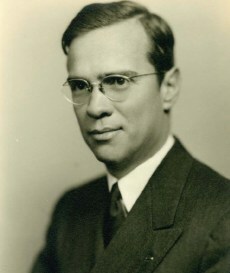 Hamlin was the first chairman of the board of directors of the Federal Reserve System, a last-minute replacement when the first choice declined because of age. Legislators and bankers started pushing for a central bank-like system after the 1907 Bankers' Panic caused the stock market to tumble nearly 38 percent in a year. To put that into perspective, the Dow lost 34 percent in 2008. Hamlin's appointment capped the several-year process to create the central bank. The process was marked by secrecy, partisan wrangling and compromise, which ended with Wilson signing the Federal Reserve Act just before Christmas in 1913. The Fed that Hamlin chaired bears little resemblance to the current institution. The first Fed "was a strange hybrid, a mixture of private and public management operating with very unclear lines of authority, and with very little centralization," Allan Meltzer, professor at Carnegie Mellon's Tepper School of Business, wrote in his book about the Fed. This separation of powers caused big problems later. World War I was raging during the early part of Harding's term, and the newly created Fed was tapped by the Treasury to issue and finance war bonds. This effectively made the Federal Reserve the fiscal agent of the Treasury, and for the first time allowed the Treasury to deposit and reimburse funds from another institution's balance sheet. After Harding left the Fed, he traveled to Cuba to advise the country on its financial and accounting system. Crissinger, a former school teacher, was one of the Fed chairs whose actions aren't well documented by historians. That's mostly because at the time power was concentrated at the regional Federal Reserve in New York, which was solely in charge of conducting open market operations. 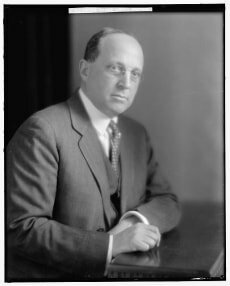 Benjamin Strong Jr., leader of the New York Fed, was the most influential shaper of monetary policy until his death in office in 1928, a year before the Great Depression, which some experts said could have been stemmed if he was still alive. Strong was present at a secret meeting on a small island off the Georgia coast when the first true discussions of creating the Fed began. And he was well-connected to the U.S. and British elite. 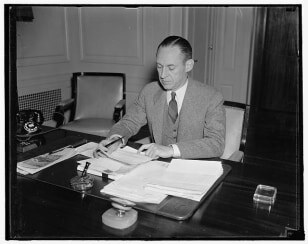 Young was in office during the lead-up and start of the Great Depression, which experts say was partially caused and prolonged by the Fed's actions. 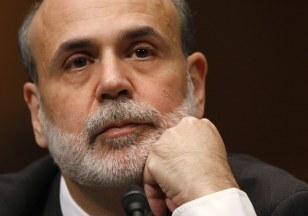 "We did it," current Fed chief Ben Bernanke said in a 2002 speech that touched on the causes of the Great Depression. "We're very sorry. But thanks to you, we won't do it again." The Fed’s board of governors lacked leadership to stop the crisis and couldn't coordinate policies, since each of the districts could act semiautonomously. For example, Young feuded over control of the Fed with George Harrison, the governor of the Federal Reserve Bank of New York, over putting direct pressure on banks without raising the discount rate. "The dispute between the Board and the New York Bank largely paralyzed monetary policy during almost the whole of the important year 1929," Milton Friedman and Anna Jacobson Schwartz argued in the book "A monetary history of the United States, 1867-1960." As part of the dispute, Young broke precedent and never signed the Fed's 1929 annual report. 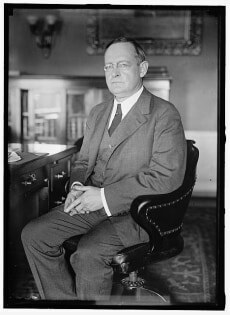 Meyer came to Washington as a "dollar-a-year" man, which referred to his government salary since the government can't accept free services, to help Woodrow Wilson during World War I. His term as Fed chair came during some of the darkest days of the Great Depression. He enjoyed support under Hoover, but the election of 1932 brought Franklin D. Roosevelt into office. Meyer resigned quickly, finding he "could not agree to going off the gold standard and an inflationary higher gold price," economist Murray Rothbard wrote in his book about the Fed. Meyer later bought the Washington Post and returned it over the next 20 years to profitability and prominence. He was also the first head of the World Bank, appointed by President Harry Truman in 1946 when Meyer was 70. 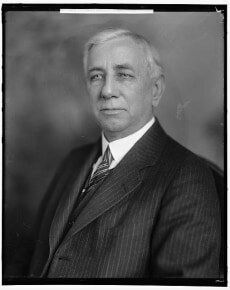 Black, as the governor of the Federal Reserve Bank of Atlanta, spent the Wall Street Crash of 1929 rushing around the South supplying large amounts of cash to keep banks from defaulting. As Fed chair he supported “expansionist” policies, working with the New York governor to increase the supply of money to help stave off defaults. In the early 1930s, amid a slew of financial reforms including the Glass-Steagall Act that were put into place after the Great Depression, the Fed was granted the right in "unusual and exigent circumstances" to lend to "any individual, partnership, or corporation" on whatever terms it wants. That clause was invoked in 2008 to justify the Fed's unprecedented lending to large financial institutions to help stave off a collapse of the financial system. 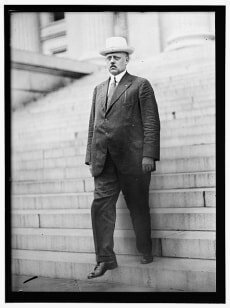 A millionaire by age 22, Eccles pushed through Congress reforms that led to the institution becoming the most powerful bank in the world. The Banking Act of 1935 created the structure of the Fed as it is today. The Fed's power was shifted from New York, with members representing major banks, to Washington, with policymakers appointed by the president and approved by Congress. The Fed chief’s title was upgraded from chairman of the board of directors to the current chairman of the board of governors. The 1935 act also formed the Federal Open Market Committee, which makes decisions about interest rates and monetary policy. The FOMC's structure was revised in 1945 to including five rotating members of the 12 regional Fed presidents. The act took some political maneuvering to pass Congress. Roosevelt linked it with two other reforms that bankers supported. Also, the Washington Post, under the direction of Eugene Meyer, the former Fed chief, changed its original opposition and backed the bill. One catch: These reforms didn't make it an independent entity. The Fed's decisions were mostly controlled by the Treasury, and it "was often uninformed about Treasury actions and plans," Meltzer wrote. This relationship escalated in the ensuing decades, and Eccles eventually resigned over the tension. McCabe took over as chairman amid tensions between the role of the Fed and the Treasury. The Fed wanted to raise interest rates to fight inflation. But that would lower the value of war bonds bought during World War II, a situation the Treasury Department and Truman wanted to avoid. Truman had an emotional stake in this: The value of the Liberty Bonds he bought during World War I fell after the war. This led him to believe the government had an obligation to protect the value of them for the patriotic Americans. The situation became even more urgent when the Korean War started going poorly for the United States. The Treasury thought it might have to issue more bonds to pay for the war effort. But the Fed balked for fear of spurring inflation. To settle the argument, Truman invited the entire Federal Open Market Committee to the White House. 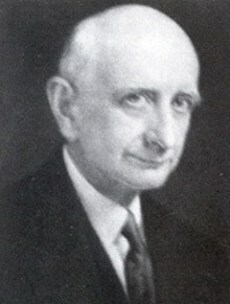 William Martin, assistant secretary of the treasury, was mediator after the Treasury Secretary John Snyder was hospitalized. The result was the 1951 Accord, which restored independence to the Fed and moved it out of the executive branch. But Snyder told Truman he could no longer work with McCabe, who submitted a bitter letter of resignation. Martin, a Truman ally, was installed after the 1951 Accord. "The initial reaction both among Board staff and on Wall Street to Martin’s appointment was that the Fed had won the battle but lost the war. That is, the Fed had broken free from the Treasury, but then the Treasury had recaptured it by installing its own man," Ralph Leach wrote in "The Treasury-Fed Accord: A New Narrative Account." But Martin supported the Fed's independence. "Some years later, Martin happened to encounter Harry Truman on a street in New York City. Truman stared at him, said one word, 'traitor,'" Leach wrote. Martin, who holds the record for longest-time spent as chairman, is famous for saying that the job of the Federal Reserve is "to take away the punch bowl just as the party gets going." Burns had a tough go of it. He presided over an upheaval in the global currency market after the Bretton Woods system collapsed, an Arab oil embargo in 1973 and the start of a period marked by “stagflation,” which vexed economists who had never seen inflation during a recession. "Everyone had an opinion about Arthur F. Burns. Labor leader George Meany called him a 'national disaster.' ... German Chancellor Helmut Schmidt characterized Burns as 'the Pope of Economics,'" Wyatt Wells wrote in his book "Economist in an Uncertain World." The Fed also was embroiled in scandal during Burns' term. Watergate burglars were arrested with $6,300 of sequentially numbered $100 bills. Burns misled reporter Bob Woodward about the source of the bills and refused to reveal the information to Sen. William Proxmire, the chair of the committee that oversaw the Fed, according to published reports and Joseph Califano's book "Inside: A Public and Private Life." Califano was a counsel for the Democratic Party and the Washington Post during Watergate. Miller was the first member of the board of governors to face a Senate confirmation vote to become chair. Previously, the Senate would confirm each member of the board at the start of their 14-year term. The president was free to choose a chairman for a four-year term from the board without an additional Senate vote. Under the Federal Reserve Reform Act of 1977, the Senate gave itself the right to confirm the president's pick by a simple majority, with 60 votes needed to break any filibuster. Miller, the only Fed chairman to come from a corporate background, received unanimous consent. Historians also consider him the least respected and successful chair in the institution’s history. He spent his brief term as the Fed chairman struggling to fight stagflation, a combination of slow growth and inflation. He tried dealing with rising inflation and unemployment at the same time, but in effect reversed neither and instead saw the dollar's value plummet. In his 11 months in office, the value of the dollar fell nearly 42 percent against the yen and 34 percent against the German mark. He frustrated Wall Street, who perceived him as making overly cautious moves during a crisis. His own Board of Governors outvoted him when he fought against a change in the discount rate at a 1979 meeting. He resigned at the end of Carter’s term. When Volcker took over the Fed, inflation was running at 13 percent a year and the dollar's value was plummeting. He is credited with ending stagflation — but at a price. He pushed the prime interest rate to a painful peak of 21.5 percent in December 1980 after which the nation plunged into a deep recession. The move devastated the construction and housing industries. Hundreds of banks failed. The unemployment rate jumped to 10.7 percent. 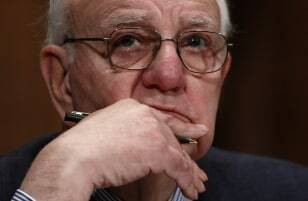 Widespread anger toward the Volcker-led Fed spurred calls for change. Builders mailed miniature two-by-fours to the board members. Angry citizens mailed house keys. Farmers drove their tractors onto Washington’s C Street, blocking Fed building entrances, according to Bernard Shull's book "The Fourth Branch: The Federal Reserve's Unlikely Rise to Power and Influence." 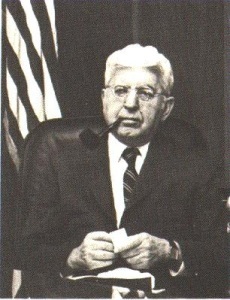 The cover of a Tennessee builders publication featured a “Wanted” poster of Volcker and accused him and the Fed of "premeditated and cold-blooded murder of millions of small businesses." But his plans worked: The nation's economy returned to growth. Greenspan was tested a little more than two months after he took the Fed's reins. Stock markets around the world crashed on Oct. 19, 1987, now known as Black Monday, with the Dow Jones industrial average shedding 22.61 percent in one day — the largest one-day percent decline in its history. One of Greenspan’s big influences was author Ayn Rand, who developed a philosophical system called Objectivism, known as having economically conservative tenets. 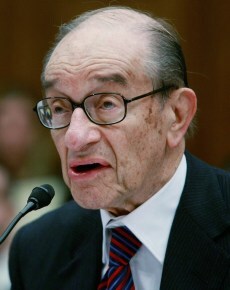 In his younger years Greenspan attended a weekly meeting of her followers, known as the Collective. A frequent topic: the futility of the central bank, according to Justin Martin, who wrote "Greenspan: The Man Behind the Money." Greenspan also helped in the research for Rand’s novel "Atlas Shrugged." Greenspan was known for his close contacts with business executives and his deep immersion in economic data. Markets hung on his every word. In a dry December 1996 speech, Greenspan, using the phrase "irrational exuberance,” warned that investors could be driving stock prices too high. Stock markets around the world fell sharply. After the prime interest rate reached a high of 21.5 percent under Volcker in 1980, Greenspan cut them to 1 percent in 2004 following the Sept. 11, 2001, terrorist attacks. His success at guiding the Fed is still hotly debated. While in office, Greenspan was lionized for presiding over the economic expansion of the 1990s and beyond. But he also stands accused of creating the easy-money environement that led to the collapse of the housing market and near-collapse of the financial sector in 2008. His defenders say the nation’s economic problems cannot be blamed solely on the Greenspan Fed. Bernanke, a former Princeton University economist, is a scholar of the Great Depression who has been faced with the task of avoiding a second. "Ben approached a financial system on the verge of collapse with calm and wisdom, with bold action and out-of-the-box thinking that has helped put the brakes on our economic free fall," Obama said when announcing he would nominate Bernanke to a second term as Fed chief. That nomination ran into opposition from both some Republicans and liberal Democrats, who generally accused the Fed of bending over backward to bail out banks and Wall Street while doing little to help ordinary citizens and small businesses. He was confirmed by the Senate for a second term on Jan. 28, 2010. He received the most "No" votes ever recorded against a Fed chairman. During his first term, Bernanke battled financial reform proposals that would strip the Fed of some of its regulatory powers. He was named the TIME Person of the Year in 2009.